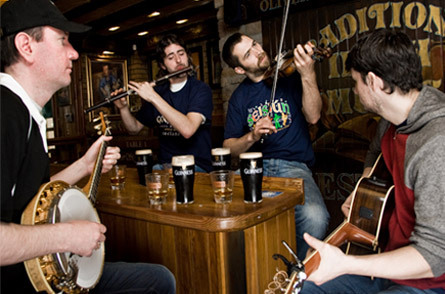 Trad music scene from Gogartys, Dublin. Summer is officially here now, and that means the hamlet of East Durham is eagerly looking forward to welcoming devout traditional music pilgrims from all over the United States and Canada to the rustic Irish American resort. The small inns and motels will be swelled once again as the tradhead cognoscenti convene to study and play with the largest ensemble of musicians plying the trad trade. This will happen when they teach and perform at the 17th annual Catskills Irish Arts Week (CIAW) taking place from July 10-16. The annual exercise in non-stop craic and sleep deprivation brings the usually sleepy village to life a la Willie Week in West Clare as one of the most important celebrations of traditional music and dance in North America. It has been my pleasure to serve as the artistic director for eight years now (time sure flies when you are having fun), and every year it creates a different set of challenges in the resort area far from its prime but resilient against the forces of present day society that have tried to write its obituary over and over. While sadly some doors close every year, others open to take their place. The community adapts to the new environ, knowing that it is the people who attend are its most valuable asset. First and foremost, the CIAW is an important activity of the Michael J. Quill Irish Cultural and Sports Centre founded in 1987 to recognize the unique Irish cultural character that the region just over two hours from New York City has displayed in the long history of Irish America. Containing 120 daily classes and a children’s program, daily topical lectures, evening concerts and ceilithe and 50 weekly music sessions for all levels, by itself it defines the mission statement of the Quill facility, and also brings in much needed funding for its seasonal operations. With support from funders like the New York State Council of the Arts, Greene County Council of the Arts, the Irish Institute NYC and the Shamrock Irish Traditional Music Society and Milwaukee’s Irish Fest Foundation, the valuable role of Irish music education and promotion has been recognized for yet another year. The involvement of Culture Ireland particularly in this year of Imagine Ireland 2011 has ensured that the very successful and formative intermingling of Irish artists from Ireland with North American artists similarly drawing from the wellspring of tradition brings multilevel mutual benefits. It also reinforces the global attraction of the music while building the reputation worldwide of that tiny corner of the world in the Catskills. Each year has seen more creativity from the recruited staff as evidenced by the number of launches for new CDs or publications heralded during this week and in the offing are 12 possibilities this year. While these times don’t reward such publications economically as they once might have, it is indicative of the expertise and commitment these artists bring to the cultural community that is fed and nourished by their efforts. Look for new work emerging from Mary Staunton, Colm Gannon and Jesse Smith (two Yanks living and working in Ireland), Pauline Conneely and Chicago Reel, Dan Milner, Len Graham (who will lecture on his new book on mentor Joe Holmes), Shannon Heaton, Randal Bays, John Carty, the Washington Square Harp and Shamrock Orchestra, Girsa and, with fingers crossed, a new album by Cherish the Ladies and a forthcoming tin whistle tutor from the Queen of the Irish Whistle Mary Bergin will cross the finish line. Lauding these contributions that foster our Irish heritage could fill up a whole week by itself, but it is only a small part of the frenetic but fun-filled CIAW activity over the six days that culminate in a day-long Andy McGann Festival on Saturday, July 16 from noon to 7 p.m. The weekdays are filled up with classes in the morning (10-11:30 a.m.) and afternoon (1:30-3 p.m.) that require advance registration and some familiarity with the chosen instruments or subjects, and this is the most important activity for transmission of the culture. After that the topical lectures (4 p.m. to 5:30 p.m.) are presented to show off the varied and profound knowledge of the assembled staff. There are eight offerings this year during the week that will include at week’s end a salute to Jimmy Kelly, Sr. and his wife Ann, the Albany couple long associated with the Catskills and Irish music in Albany to take place on Friday afternoon, July 15 at the Blackthorne Resort. The Quill grounds provide a wonderful open-air atmosphere for the daily evening concerts for students and the general public where over 10 hours of the week the talented staff hold center court in a fascinating performance parade nightly from 7:30 to 9:30 p.m. Dancers are catered to every night for ceilithe on wonderful wood floors at the Weldon and Shamrock House and also over in Leeds at the Inn at Leeds enjoying the best of music from varied bands who will perform for seven ceilithe. A highlight this year is an out-of-town excursion to the Big Apple at the invitation of Lincoln Center’s Midsummer Night Swing (www.lincolncenter.org) for an Irish Dance Night on Wednesday, July 13 from 6 p.m. to 10 p.m. Providing lively dance music for the occasion are CIAW staff musicians from Ireland Charlie Harris, Maeve Donnelly, Eamonn and Geraldine Cotter, John Carty and Caitlin nic Gabhann who appear as part of the Imagine Ireland 2011 enterprise. There will be dance instruction by Megan Downes and DJ work by Kevin Westley. You might think that all that activity would have folks worn out at the end of the day, but then the session scene kicks into gear featuring all the staff in scintillating sessions often with fellow musicians who are new to them. As many as eight take place simultaneously in the area’s resorts and roadhouses, each with their own ambiance and historic setting and pegged as intermediate, open or our very special branded Listening Room sessions that are unstructured musical conversations among the very finest artists assembled. There is even a nightly singing club named in honor of the great Dublin singer Frank Harte that takes place in Gavin’s tea room around 10 p.m. where a great array of singers and styles appear every night regaling one another with colorful lyrics and topical songs, funny and sad but never indifferent. Students and punters rub shoulders with the top talent in town starting at 10 p.m. until the last notes are played which at times isn’t very distant from the first morning school bell. The socialization and the craic has mushroomed over the years, and reflects a very nomadic community who turn up wherever music like this is relished and enjoyed. Where can you find out about the Catskills Irish Arts Week? You can visit the webpage at www.catskillsirishartsweek.org where details on the summer school exist. Outside of the classes, events are open to the general public and a detailed schedule will be available on line a week before the CIAW opens. You can also find a list of accommodations and there are rooms still available. Hope to see you there.